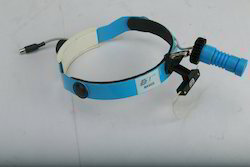 Offering you a complete choice of products which include headlight led surgical loupes. Our range of Headlight Surgical Loupes is ideal for ophthalmic, ENT, dynamic &dermatology application. Procured from reliable vendors, we further cross checks these lamps at our premises to ensure that optimum quality and functionality.